Here's the next installment in BMG Classics' newest Toscanini retrospective. These discs contain the same recordings, but they offer much better sonics than those included in the label's first attempt to bring the Toscanini legacy to CD. They bear the signature of Walfredo Toscanini (the conductor's grandson), Allan Steckler (manager of the conductor's estate), and Niels Høirup (product development at BMG Classics). Major innovations in sound preservation and processing – including 20-bit recording technology, UV22TM Super CD Encoding, Cello and Studer tape systems – seem to have been the secret of success this time around. If one does an A:B comparison between the old and new CDs, the improvement is noticeable almost immediately. As I mentioned in earlier reviews, now the sound is more airy, and a natural-sounding resonance has juiced up the soundstage. The bass is more present than before, and the occasional stridency of the treble has been tamed without an apparent loss of musical information. Also, there is less noise. The instruments have more presence and separation. These are monaural recordings, and some of them are more than 50 years old, but BMG Classics' latest techniques have made them very listenable. It is worth repeating here that these volumes are twofers – two discs for the price of one – so this series is a better value than the previous one. The discs of Italian orchestral music contain some particularly strong performances. Toscanini conducts Respighi's "Roman Trilogy" with white-hot commitment, and the more vulgar the music gets (for example, at the end of Roman Festivals), the more passionate the conductor's response. However, even when Respighi's imagination seems on the verge of galloping out of control, Toscanini keeps his hands on the reins of the NBC Symphony Orchestra; precision and form are not sacrificed. The second disc, consisting entirely of operatic excerpts, contains some beautiful performances, notably the Semiramide overture by Rossini, where you can feel Toscanini inspiring the orchestra to give 120% of themselves. The "Dance of the Hours" from Ponchielli's La Gioconda also is bright and brilliant, and unusual attention is given even to the William Tell overture, a piece that practically plays itself. Unfortunately, this set almost puts itself out of the running with a careless editing error: the first phrase of the L'Italiana in Algeri overture is missing; it was present in the first CD release. The sound in this Carnegie Hall recording from 1950 was not good to begin with; it is hardly more acceptable here. In its previous CD release, Toscanini's 1951 broadcast from Carnegie Hall of the Verdi Requiem didn't fit on a single disc; here it does, for a total timing of 77:44. There are times when I wish that Toscanini would pause for a moment to savor Verdi's exalted writing; it wouldn't have been self-indulgent to spend a little more time in the "Agnus Dei," for example – 4:38 in this recording, more than two minutes faster in Victor De Sabata's EMI recording from three years later. We know that Toscanini's heart is in the right place, though. Herva Nelli, his soprano, has an unusual voice; it has a young timbre, and at times one that has a pleasant sourness, like balsamic vinegar. Nevertheless, she can cut through the most outrageous climaxes, and she does a great job with the "Libera me." Fedora Barbieri is predictably imposing, and not as vulnerable as Nelli. Giuseppe di Stefano is on good behavior here, and his voice was still in prime shape when this broadcast took place. Bass Cesare Siepi sings with an Italianate sense of line, but not as darkly as others have in this music. The Robert Shaw Chorale is outstandingly prepared and highly effective. Shaw's Chorale also is featured in the Verdi Te Deum from 1954 (another broadcast from Carnegie Hall) and in Cherubini's Requiem. Toscanini studied the former work with Verdi himself, and this performance is devout, austere, yet warmed by the Italian sun. The choral work is even better here than it was in the Requiem. When he was a child, Toscanini sang in a performance of Cherubini's C-Minor Requiem, but he conducted it infrequently. In fact, the 1950 broadcast from Studio 8-H that is presented here may be Toscanini's first and last "go" at this work as a conductor. I suspect he was waiting for the right chorus and choral director; he found them both in Robert Shaw and his Chorale. Once this broadcast was over, perhaps there was nowhere else to go but down. Then again, this isn't a very challenging or rewarding requiem for the conductor. Toscanini conducted Verdi's Falstaff nearly as much as any other opera. Verdi was still alive in 1894 when Toscanini – only in his 20s – conducted it for the first time, and he performed it then and subsequently with some of the première's singers, including Antonio Pini-Corsi as Ford. 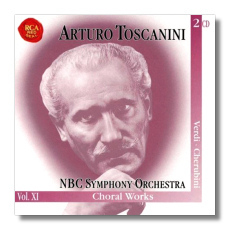 By 1950, when the present recording was broadcast from Studio 8-H in New York, Toscanini was 83, and even older than Verdi himself when he had completed this last of his operas. The conductor called Falstaff "quicksilver" from beginning to end, and his interpretation, while not relentless, moves along with agile grace, even when Verdi's music is at its most rotund. It must be frustrating to conduct this opera, and tempting to linger. It is filled with melodic ideas sufficient for five operas, and many of them vanish as soon as they appear. You're left hungering for more. In the title role, baritone Giuseppe Valdengo eschews cheap, grotesque exaggerations; there are no "fat jokes" here. His Falstaff is almost a viable lover, but Toscanini ensures that the "almost" is never forgotten. Frank Guarerra is a solid Ford, and the supporting male roles are played with subtlety, even though they are comic. The only exception is tenor Antonio Madasi's unsteady Fenton. Here, Nelli is a nimble Alice – not sweet-toned, but characterful, and the darker mezzo-soprano of Nan Merriman is a good foil for Nelli's soprano voice. Elmo is a richly comic Quickly, and Stich-Randall a chirping, girlish Nannetta. There is well-deserved applause after each act, and there is cheering at the end. The sound is dry, with occasional discoloration at the climaxes, but it is a definite improvement over the previous CD release. BMG offers a full libretto (riddled with typographical errors, though), yet it and the two discs are packed into unique case that is only slightly wider than the conventional jewel box – a good design, that. As on the previous nine volumes, the spines of the CDs consistently identify Toscanini's orchestra as the "NBC Symphoniy [sic] Orchestra." There are more and more signs that BMG Classics thinks that this series will sell itself, but their carelessness in packaging, and now in editing the recordings, is worthy neither of the conductor nor or of the music.